We’d love your help. 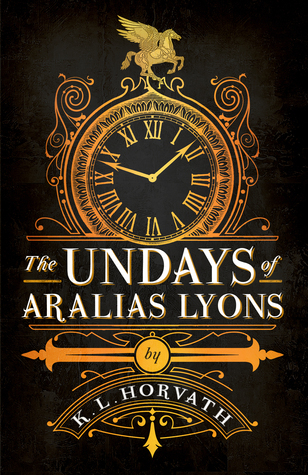 Let us know what’s wrong with this preview of The Undays of Aralias Lyons by K.L. Horvath. For centuries the great Houses of Time have watched over the mythical creatures, those who manipulate the past for their own ends and humankind. But now the houses have dwindled and few are left who remember the mandates. One, in fact, Don’t miss K.L. Horvath’s compelling time travel fantasy with talking beasts, iron monsters, otherworldly creatures and a desperate father! To ask other readers questions about The Undays of Aralias Lyons, please sign up. Aralias can move back in time. He is a traveller. Clara Heartwell is a widow and an archaeologist who crosses paths with Aralias when he comes to return a lost relic that was given to her. Together they work together to save his son Jack who was kidnapped by a mad who wants power over time. They are faced with many dangers along the way. The Undays of Aralias Lyons was an OK read. It is set in the Victorian Era, with a steampunk setting with some fantasy added to it. The description was very well done and very vivid. The creatures were also very original and there was some good world building. It is obvious the author has a great imagination. The writing was good, but I did notice a few times that there were commas where there wasn't supposed to be commas, and no comma when there should have been one. It wasn't the biggest issue, but the story probably could have done with a little bit more editing. The characters, to me, were not that memorable. I didn't really connect to any of them and that is why I am only giving a 3 star rating. I was not bothered at all what happened to the characters, which is unfortunate. If the characters impacted me more then I probably would have enjoyed The Undays of Aralias Lyons more considering there was a lot of the story which was character driven, and a lot of scenes where Aralias and Clara were just bickering. The story itself was good, but when I got about 30% in, I just started losing interest. A personal opinion, but I think the author failed to keep the momentum and the suspense going. This led to me enjoying it less. Received as an ARC from Netgalley. Not sure what to think about this one... I got confused easily so had to keep reading previous parts. I didn't particularly care for any of the characters, and if I was to ever meet Aralias I'm more likely to slap him than hug him!!!! Saying that though, it was a quick paced read. And the idea of the book was a good one, shame the flow of it was bit... Iffy is the only word I can think off!! Going into this knowing pretty much nothing other than it involved time travel, The Undays of Aralias Lyons ended up being an entertaining read - but not necessarily one I would pick up if I could go back in time myself. The biggest thing that stuck out about the writing in this book was the fact it felt like I'd been thrown into the middle of the story. Knowing not a lot about this to start with, I genuinely thought I had missed a book in the series - so I accepted that there were things I wasn't going to understand at first. But then I found out this is Horvath's debut as a published author. And that was a problem. I'm happy to not be spoon fed information, but with so many bizarre variations on the world (talking animals, a huge variety of ages that are never stated, strange rules about time travel) we need a little explanation as to what's happening so it doesn't distract us from the story itself. I found this with the exposition too: while I enjoyed picking up parts of Aralias' past as we went along, I didn't really feel the gravity of danger because we're never really told what Bliss has done to be so evil. Overall, I think Horvath ran ahead of herself in excitement but just needed to slow down and think. Horvath has definitely created an imaginative story. Although I haven't read a vast selection of books looking at time travel, I think the locations chosen as well as the times worked nicely as a backdrop for the story. I probably would've liked these places to have a little more importance to the story, but they were nice to see things play out in nonetheless. There isn't that much I can really say about the story other than it was entertaining enough to take up my time, but quite frankly by the end I was a bit bored. I think there's loads of continuity errors in the time-travelling parts but I couldn't keep track of the confusion enough to be sure. And that's fine - for a while. But as it dragged further and on I found it harder and harder to stay engaged, and the fact the book goes on for an unnecessarily long amount of time after the resolution didn't really help. Aside from the two protagonists I didn't find many of the characters particularly distinguishable. The way you could tell them apart was how bluntly rude or polite Aralias was to them, and I feel like if a little more development had gone into these people there would've been a stronger foundation for the rest of the story to lie on. While I really enjoyed the father/son relationship Aralias had with Jack (not least because it's something we rarely see these days, especially in fantasy adventures like this) and thought it worked really well to add some depth to his character, he was still incredibly irritating and arrogant. I understand that the questionable attitude was in place partially to get some interesting banter between the characters but he came off as a mean person some of the time, and I'm pretty sure we're supposed to think of him as a real hero. He definitely was not in my eyes. Clara has me in two minds: on the one hand she played her part in the story well enough. But I can't stop thinking about how paper-thin her personality actually was: she mainly argued with the characters, had a very speedy romance with Aralias and shot a pistol every now and then (though to say this was apparent only with Clara would be a lie). To be perfectly honest, I never thought I'd read a book where the woman doesn't even get to the climax location because she's crying on the floor. The pacing was dealt with well - whenever I got bored or lost track of what was going on it was definitely due to the explanations of the story as opposed to the pacing not being established. Though you might expect something a little more creative than just following the main protagonists going back and forth from he present for a book where time travel is a main theme, it was probably wiser in hindsight for Horvath to reign in her excitement for the story in this area. Though I still don't feel it excelled in many areas, by making sure big events were nicely spaced throughout the whole book we avoided any complete train wrecks. I truly wish I were able to post half-stars because this is certainly a 3.5/5-star book for me because of the novel’s inconsistency. It’s a novel of extremes: what’s done well, is done really well; but what’s not done so well becomes a serious problem for the reader. First, the positives: these characters are great. Truly, the team of characters assembled in this novel are such a joy to read. Our protagonist, the titular Aralias Lyons, is a Victorian-era version of David Tennant’s Tenth Doctor – specifically that Doctor’s predilection for stream-of-consciousness speeches that took place at top speed. Combine that with a snarky gruffness of an Indiana Jones-type and a wonderful devotion to his son and, well, that’s Aralias Lyons in a nutshell. I praise Ms. Horvath’s ability to capture what we in the 21st century see as Victorian-era speech and keep with the speech pattern consistently throughout the novel because it’s one of those things that, for me, helped shape Aralias more clearly in my mind. Aralias has the potential to become a true conundrum within his own story, particularly in his interactions with Clara Heartwell. Clara is introduced early into the story and swiftly becomes a romantic interest for Aralias. While I admit that the two of them together had some lovely moments – especially in the last third – I never truly bought into their chemistry. I’m willing to suspend my disbelief, especially when it comes to books on time travel, but their romance never clicked with me. I just simply didn’t buy it, no matter how much I wanted to. Speaking of time travel, I never really did wrap my head exactly around how it all worked. There were scattered puzzle pieces I thought I understood, but if you asked me to explain to you the mechanics of this novel’s time travel, I wouldn’t be able to. The writing is simple, but that doesn’t dampen the vividness of its imagery. When Ms. Horvath describes the segments where we, as the reader, travel through time with Aralias and experience multiple different spaces in time, her writing is full and lush – it’s all technicolour with high saturation. Unfortunately it does mean the rest of the book’s writing and storytelling is left rather grey. This novel could have used another round or two of edits in order to help the cadence and flow of the story: it’s terribly uneven and makes for a less-desirable reading experience. A shame given what parts of the story flow well are supremely entertaining. The Undays of Aralias Lyons grabbed my attention right away. I’m not sure what fascinates me about time travel novels, but when they are done well, as this one is, I’m sucked in and can’t stop talking about them for months. I was immediately drawn to the two main characters, Aralias Lyons and Clara Heartwell. Aralias reminds me of Sherlock Holmes, a man very sure of himself and his place in the world. But a woman, who is just as sure of herself and her place in the world, throws him for a loop. Similar to how Holmes is intrigued by Irene Adler. Aralias’s and Clara’s witty banter and arguments made their relationship genuine. And the minute you figure out what “the Undays” are your heart breaks a little for them. As a lover of time travel novels, I’m always keen regarding how different authors approach the science of time travel. Can you change history? What happens if you run into another version of yourself? Is time travel genetic or does it require some special tool (or both)? Horvath’s novel gets a little weedy and I got a bit lost trying to keep track of the different versions because there are no problems with encountering past versions of yourself. But the encounters are brief and necessary to the plot based on the rules of the Travelers in Horvath’s universe. So disorientation, which must be as similar as encountering another version of yourself, is limited. As the story started to wrap up, I got a little sad. I had grown to love Clara and Aralias. I didn’t want the story to end. I felt like I was part of their world, their story, their love, their battle against Bliss. I certainly didn’t want it to end. (It’s probably one of the many reasons I jumped right into another time travel novel so quickly when I was done). This novel was a happy discovery. The characters are intriguing and real. The time travel plot adds a few twists and turns I wasn’t expecting. I would definitely recommend this novel if you are looking for a compelling time travel novel with a genuine love story on the side. Aralias Lyons belongs to an eccentric family of Travelers living in 19th century England. When he meets Clara Heartwell, widowed wife of a famous archeologist, he discovers she holds a significant artifact that allows him to more precisely control time. Together they travel back in time—fighting iron dragons, poisonous marsiders, and clockwork men—in a desperate attempt to save Aralias's son Jack from the mind torture of the evil Simeon Bliss, a heinous megalomaniac with a potent desire for cont Aralias Lyons belongs to an eccentric family of Travelers living in 19th century England. When he meets Clara Heartwell, widowed wife of a famous archeologist, he discovers she holds a significant artifact that allows him to more precisely control time. Together they travel back in time—fighting iron dragons, poisonous marsiders, and clockwork men—in a desperate attempt to save Aralias's son Jack from the mind torture of the evil Simeon Bliss, a heinous megalomaniac with a potent desire for control and power. I hoped The Undays of Aralias Lyons by K.L Horvath would be an engaging and exciting book with all the complications of time-travel and mystical creatures. It almost was, by which I mean it had the mystical creatures and it was complicated, but other than that, it disappointed me. The Undays of Aralias Lyons read like a book full of potential that missed the point at times. The plot in a way made sense: man must use his ability to time-travel in order to save his son. To some extent, this is what happened. Only I wish it were that simple. The rules of this world never were fully explained and I never appreciated how the time-travelling worked: did they need a watch or not? Did the key to unlock time heighten their powers or just give them more specific destinations? The only thing I felt sure about was they couldn’t go back in time to kill the bad guy. Other than that, I was lost. The characters annoyed me. Aralias had the potential to be a dashing hero, or a charming aristocrat, a good father and a satisfactory lover. Only instead, he read as just being shallow. Rather than caring for his traumatised son, he moped around over a potential lost love. He forgot about his son for half the book and his characteristics went from one extreme to another that it never felt like the reader was given a chance to truly know him. The tension might have been stronger if I knew what was actually going on! The moments that should have been tense were undermined by the complexity of where and when the characters were, how they got there and precisely what sort of threat they were facing. Unfortunately, the writing itself let this book down. There was too much forced dialogue and the lack of clarity about the time-travelling rules undermined the plot. The characters came across as weak and selfish, apart from Jack who was barely in it. This was an early release copy given to me from Netgalley. There might be some changes in the final copy of the book. Aralias Lyons can fall back into time, He can't go forward (not anymore) just back. Clara Elizabeth Heartwell is an archaeologist That provides a lot of help in this adventurous tale. She is smart and full of spirit and she is not the type of girl to sit around or run when friends are in danger. Jack is Aralias' son. He is kidnapped by a power mad, crazy person and must be saved. This was an early release copy given to me from Netgalley. There might be some changes in the final copy of the book. Jack is Aralias' son. He is kidnapped by a power mad, crazy person and must be saved. He has the same gifts as his father, except he can go forward into the future. Together with various allies Clara and Aralias must race against time to save Jack and the world! Some of the crazy things they come up against are: iron dragons, marsiders, derailed trains, prison and an army of clockwork men. The story itself races along at a good pace. I read most of the story in a day and didn't really get tired of it at all. I found all the characters interesting, with unique quirks and problems. The worst I can say is that some of the side characters aren't very well drawn or interesting really, but that is made up for by the mains. The setting was interesting and full of cool inventive ideas. A big plus for me was the fact that I love time travel stories. If a book (or movie or TV show) has interesting take on time travel that seems plausible and doesn't confuse me or use it to cover up plot holes, I'm most likely going to like it. Maybe my favorite thing about the book is, well....It's fun! I miss reading fun adventurous stories. As you get older there is pressure to leave such things behind and read "important" books only. It' why people look down on others for reading and enjoying YA novels, I suppose. I think that's a load of BS. Read what you want! I received a copy from the Netgalley in exchange for an honest review. Where to start? I guess you could say the main characters were Aralias Lyons, his son Jack, a woman by the name of Clara Heartwell, Nicholas Seraph and the bad guy of the story, Simeon Bliss. Bliss had minions and Aralia’s also had other family members in the mix. Aralias is not quite human. He is a 223-year-old traveler. A guardian of the rotating sun. A traveler of time. His son Jack starts the story out at 9, but becomes 14 I received a copy from the Netgalley in exchange for an honest review. Where to start? I guess you could say the main characters were Aralias Lyons, his son Jack, a woman by the name of Clara Heartwell, Nicholas Seraph and the bad guy of the story, Simeon Bliss. Bliss had minions and Aralia’s also had other family members in the mix. Aralias is not quite human. He is a 223-year-old traveler. A guardian of the rotating sun. A traveler of time. His son Jack starts the story out at 9, but becomes 14 by the end. I found myself flip flopping with this book. From loving it one minute, Aralias riding a Pegasus in battle. To thinking ‘oh shut up’ at Clara and Aralias banter the next. For me the story didn’t really start to pick up until we see Jack using his powers for the first time and future Jack coming back to warn his dad about Bliss’s Dragon attack – this all happened around the 20-30% - so it was a bit of a slow starter for me. What I liked: The detailed Victorian-Steampunk-awesomeness! Aralias fight through time to save his son and as it turned out, the whole of time itself. Individually I liked all the characters and felt they all had their own purpose in the story. What I Didn’t: I love romance in adventure stories, but I didn’t click with Clara and Aralias. I think the father-son-bond would have been more than enough to push this story along. I liked Clara and felt she was important to the story, but the romance between her and Aralias was awkward, unnecessary and frustrating. I think if she just grew to be their adventure loving friend the story would have flowed better. I tried a few times to break into this book, and was thwarted every time. The writing was awkward ("Her gaze was not transfixed on him") ("Six magnificent thoroughbreds snorted at the reins like a strange engine") and sometimes pedantic ("it’s not a pistol. It’s a Colt .45 revolver"; definition of revolver: "pistol with revolving chamber"), and remarkably unenlightening. It felt like the writer chopped off several introductory chapters – or lost a whole previous book; I had no idea what was supp I tried a few times to break into this book, and was thwarted every time. The writing was awkward ("Her gaze was not transfixed on him") ("Six magnificent thoroughbreds snorted at the reins like a strange engine") and sometimes pedantic ("it’s not a pistol. It’s a Colt .45 revolver"; definition of revolver: "pistol with revolving chamber"), and remarkably unenlightening. It felt like the writer chopped off several introductory chapters – or lost a whole previous book; I had no idea what was supposed to be going on. And before long I simply wasn't interested. I often fall back on food-related similes to try to capture my feelings about a book, and this felt like lumpy, somewhat congealed oatmeal – it was grainy and dense and difficult. And by "difficult" I don't mean "challenging", but "I shouldn't be having this much trouble wading through the text and figuring out the plot and the characters". Yeah. The only reason I didn't hate it was because I couldn't muster up that much emotion. It was hard, and not in a good way – and ultimately not worth the effort. I received a free copy through Netgalley in return for an honest review. 'The Undays of Aralias Lyons' is quite a lengthy novel. Most of the time I quite liked it; not in the wow kind of liking it, but the writing was done well, and I was thoroughly taken in by the events in the story. Certainly towards the end it did seem to put events and action together, without making it into a story. It might also have been the jumping throught time over and over again that made me feel this way a little more I received a free copy through Netgalley in return for an honest review. In my personal opinion this book was so disjointed and hard to follow that even the parts of the story that I started to like were ruined by the next paragraph, page, or even a few times the very next sentence. Overall I personally rate this book a 1/10. I received this book in exchange for an honest review. Now this was interesting and a lot of fun. I actually enjoyed the story after a slow start. Great characters and story line it all flowed well except when the romance was thrown in. But lots of fun and excitement!